I can't quite believe it!!! 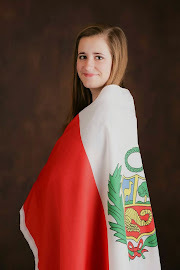 My very last letter to you all as a missionary! These last few days my mind has been full of so many things it makes it kind of hard to sleep! But more than anything, I think the greatest feeling I have as I'm finishing my time as a full-time missionary, is of gratitude. Growing up I always thought it would be cool to serve a mission, but it really wasn't in ''my plans''. But the Lord was able to direct me to where I needed to be. Here! To help others learn the precious truths they need to return to God's presence, and also for me to learn the SAME. It hasn't been easy! That is FOR SURE! 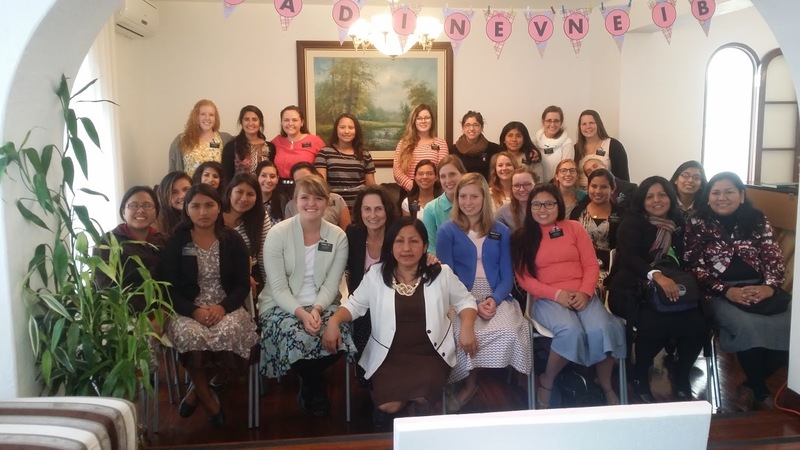 But now I can see the blessings and lessons that I have learned from the hardest times I went through in the mission. I learned how to have more patience, with others AND myself, to love more selflessly, and to listen and recognize the Spirit in my life. And those are priceless lessons that I am SO greatful for! Sometimes, many times, I felt as if what I was doing here didn't really matter too much: didn't find many people to teach, or didn't have the best indicators, or a million other things that Satan kept trying to tell me to convince me that what I did wouldn't make a difference. But the Spirit, on just as many occasions, has helped me see that as I tried my best, the Savior has made up the difference. And it is SO true in all our lives in whatever circumstance we might be in! Satan might try to tell us that we aren't good enough. But as we do our best to serve others, live the commandments, and trust in the Lord, we will see just how much He can do THROUGH us! I love you all so much! Thank you for all your letters and prayers for me! I have felt them in times when I needed them the most! I know that this church is true. That the Book of Mormon is the word of God and will guide us and teach us what we must to. I know that Joseph Smith was a prophet and that we have a living prophet here on the earth! Se, sin niguna duda que el Senor nos protege y nos guie en nuestros affliciones. Se que el Vive! pics: We went to clean the beach! Wow, what a RIDE these last few weeks have been!! But I have learned a TON. 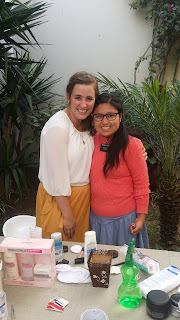 Almost two weeks ago, my companion, Hermana Landazuri got really sick. Her stomach hurt really bad and just wouldn' t go away. So we've been in and out of health clinics and back and forth from Trujillo for so long. We haven't been out to really teach in so long and our poor area was in bad shape. BUT, just as the Lord gives us challenges, he will ALWAYS give us the power and strength we need to overcome them. And he will bless us for our efforts. BUT it doesn't stop there!! We go to church on Sunday and Eric, our investigator, showed up on his own and stayed the whole 3 hours and he loved it!! They talked about temples and family history work in Priesthood class, and when he came out he was so ready to make an acount in familysearch.org and everything. So AWESOME. 2 For verily I say unto you, blessed is he that keepeth my commandments, whether in life or in death; and he that isfaithful in tribulation, the reward of the same is greater in the kingdom of heaven. I don't have much time left this week, but I wanted to share something that touched my heart as I was studying this week. This week has been a very dificult one with a very sick companion and a million other things. Those ''satan speed bumps'' I mentioned last week have turned into ''satan MOUNTAINS''. Now they never had fought, yet they did not fear death; and they did think more upon the liberty of theirfathers than they did upon their lives; yea, they had beentaught by their mothers, that if they did not doubt, God would deliver them. It really caught my eye the last part about how these sons KNEW that their mothers had faith and did not doubt. It made me think that one day, I want to be a mother, sister, friend like that. The Lord will put trials and tests so that I can develop that kind of faith. Just like these mothers here in this story went through SO much when their husbands were killed by the Lamanites and a whole bunch of other things. They strengthend their faith and taught their sons to do so as well. I suppose that's why we have ''satan mountains'' put in front of us--to help us find our own faith. I hope that everyone is enjoying a day full of summer fun and fireworks!! Here in Peru, we woke up today to a cloudy sky and a COLD ocean wind! But we've got a sweet barbeque planned out for our zone for P-day! But anyway this week has been a bit of a slower week with a lot of what I call ''satan speed bumps''. Eric started working this week and we haven't been able to get in to teach him AT ALL! Also Vanessa, a less-active we are teaching, lost her cellphone so we haven't been able to contact to teach her at all either! And a lot of other small things that really knocked us down a bit this week. But I was able to do an exchange with the other sisters in the zone! It was wonderful to be with Hermana Perez for the day and we were able to teach a lady, Irene, in her small, humble little house. There was a sweet spirit there that helped me remember why I am here and that my Savior loves me. I hope that everything has gone well for everyone this week! Here in Peru things are going pretty well! Lots of walking and preachin'! Eric is doing really well! He accepted a baptismal date for July 23! And he already is seeing the blessings of keeping the comandments. He's been without work for a LONG time, but this week he was able to find a possible job! Now we just gotta hit the whole ''keep the sabbath day holy'' deal :) But I'm sure he'll do fine. It's been fun seeing his faith grow even in the little time we've been with him. Other than that, we're still working with the ward to find some good less-actives and investigators! But to finish, I've really been thinking about the Savior this week. It caught my eye a while ago in the sacrament prayer how it says that we are to ''always remember him''. Even as a missionary, it can be hard to ALWAYS remember him! Doing small things to remember Christ in the day has helped me find peace and strength this week! PICS. These are pictures from our cake night activity last week!!! Another transfer has come and gone! 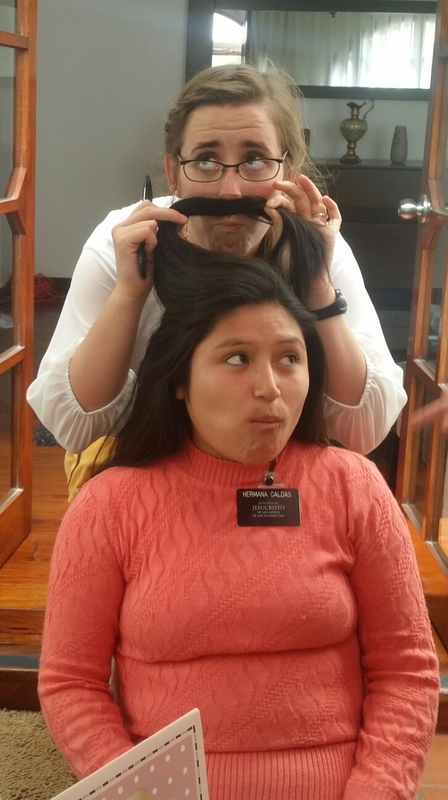 Turns out I'll be staying here in El Carmen with my same companion, Hermana Landazuri, for these last few weeks! It's kind of amazing how fast time is going! Well, this week was bit of a rough one with a trip to Trujillo for 2 days, a sick companion and a huge ward activity to plan and execute. Needless to say, we didn't get much proselyting done :( BUT with the few visits we got in this week we were able to find some awesome people! The first is a guy named Eric. The Elders called us one day with his referral. So we went and knocked on his door and he let us in! He's 45 and was in the army for years, but for some reason decided to leave. Since then he hasn't really had a stable job and feels like he's missing something! We were able to teach a little and he is super excited. He even came to our ward activity and loved it!! We are super excited to see how he is going to progress! The ward activity we had was a HUGE sucess!! It was kind of funny actually. We had SOOO many problems getting it pulled off in the first place! No one had keys to the church, there wasn't anything to decorate the chapel, we didn't have plates or cups, and a million other things. BUT it alll finally worked out in the end!! Angles were DEFINITELY ''round about to bear [me] up''! A bunch of members brought cakes and we played games and ate and had a great time! ''people are just about as happy as they make up their minds to be''. It is SOOO true. Life is hard sometimes. But they are hardships given to us by a loving Heavenly Father to help us learn and grow! And we can choose to be happy or grouchy about them :) It's not easy, but that's why the Savior is there to help and guide us! Pics. 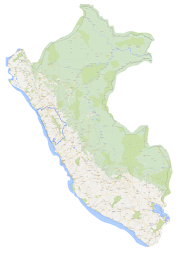 We hiked this HUUUGE mountain here in Chimbote called Cerro La Paz and it was AWESOME!!! You know Mount. Doom from Lord of the Rings? It was JUST LIKE THAT. No joke. I hope that all is well and things are going great for you! This week was a lot slower than last week, but we were able to visit Rosa Huaman and her little boy with Down Syndrome, John! We went and taught about prophets and the importance of following the prophets. Because Hna. Rosa is from the mountain reigons, she doesn't have too much of an education. BUT a huge blessing is that she can READ!! We were so happy when we were singing hymns (John, LOVES singing!) and she was following along and reading the lyrics! But we still have to go pretty slowly for her to understand. A girl in our ward got baptized on Saturday and we invited Rosa and she said yes! We got to go and have a great time at the church and she got to meet some of the members of our ward. The difficulty Rosa has is that she works in the market on Sunday mornings right when we have church. We are hoping that because she was able to come the chapel and feel the spirit, that it will be easier for her to make the decision to stop working on Sundays. Other than that, just a lot of walking and working! We are trying to work with the ward a bit more to find some good less-actives who are ready to come back to church! ...know thou, my son, that all these things shall give thee experience, and shall be for thy good. Keep truckin' along! Love you all!